I roasted two whole chickens for my diabetic dog and he turned up his nose at the meat. Hmph. What do do with all that cooked chicken? Got it. Re-make an old blog post and update the recipe and pics. Winner! I love this recipe because it’s super fast. You literally mix all the ingredients together and slap the mixture into tortillas, top with more mixture, cheese and bake for 40 minutes. It’s fast and easy and looks impressive! I changed the recipe slightly from when I last made this dish six years ago. I used low-carb tortillas because they weren’t egregiously priced at the grocery store this morning and I love how much fiber they contain. I swear they don’t taste any different than regular flour tortillas. I added a bit more chicken and a bit more salsa, plus added some garlic and cilantro to the mixture. I used eight tortillas instead of the recommended six and topped the dish with some fresh cilantro before cooking. 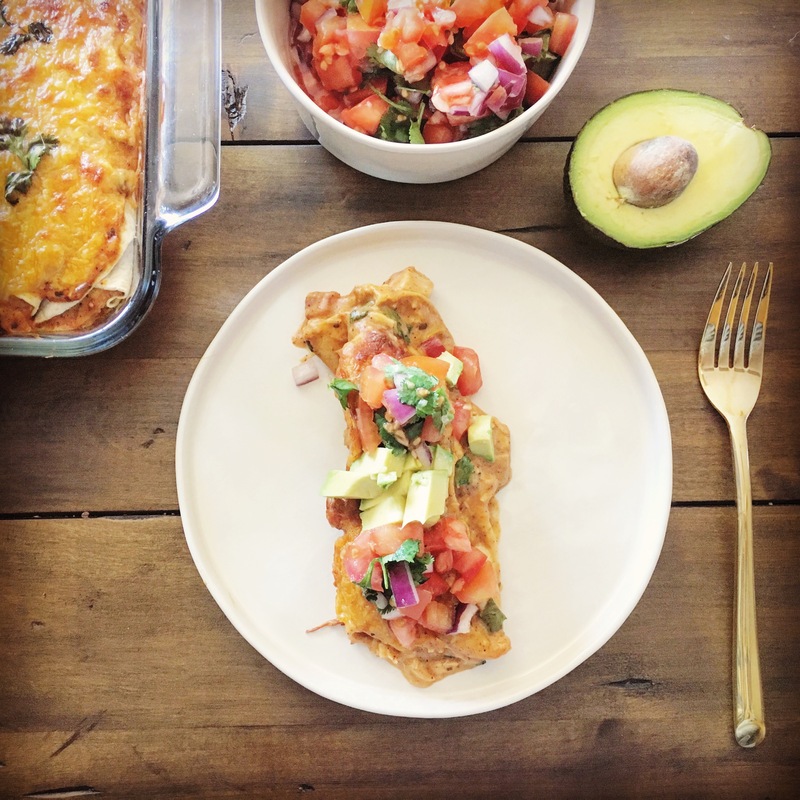 After I pulled the dish out of the oven I topped my enchilada with pico de gallo and cubed avocado. Stir soup, sour cream, salsa, cilantro, garlic and chili powder in medium bowl. 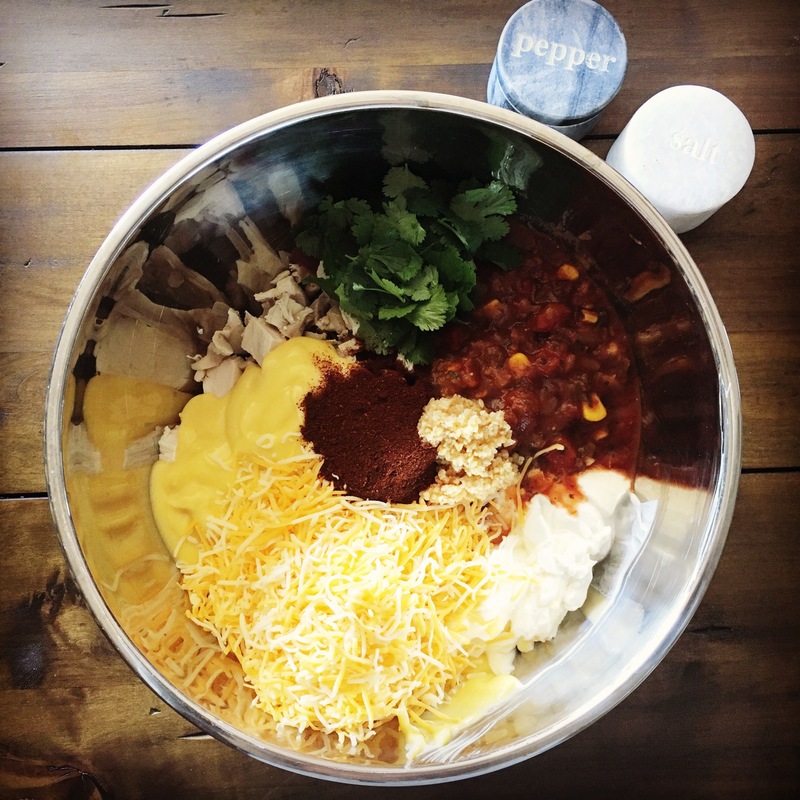 Stir 1 cup salsa mixture, chicken, and cheese in large bowl. Roll up tortillas and place seam side up in a 2 qt. shallow baking dish. Pour remaining salsa sauce mixture over filled tortillas. Sprinkle more shredded cheese on top. Cover baking dish with tin foil. I totally made this wrong and didn’t know it until I was re-blogging but the entire time I was making dish I kept thinking how the dish just seemed wrong. I have a tendency to not fully read directions which results in some interesting twists and turns at times. In this instance I mixed all ingredients together right from the star. So at the end I had to top the enchiladas with more sauce that contained chicken. Not a big deal … it’s just that in most enchiladas the meat is inside the tortilla not on top! 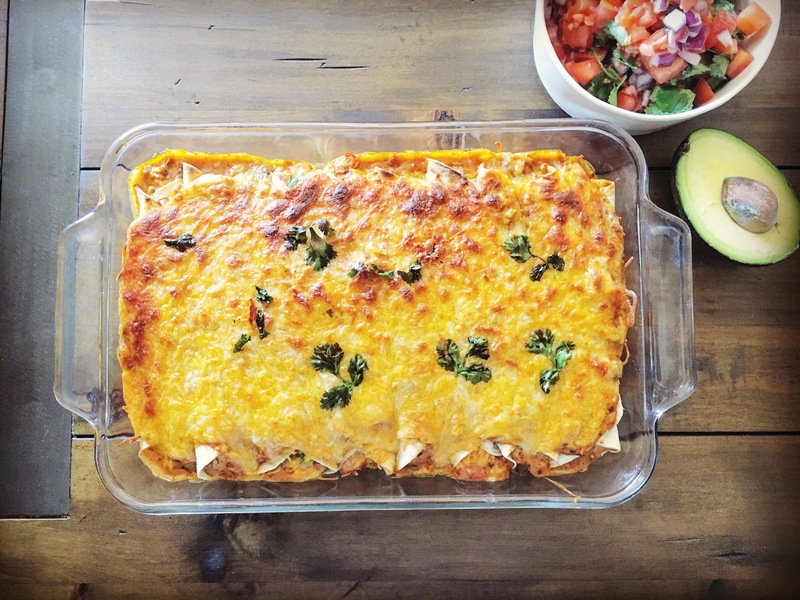 My mom sent me this recipe and though it’s far from traditional enchiladas, these really are amazing: rich and heavy with sauce and cheese, one enchilada will sustain you for hours. I decided we would make these for dinner tonight because Kiki saw the picture in my gallery and thought they looked good. These are super easy and super fast to make. Stir soup, sour cream, salsa and chili powder in medium bowl.